With 150 select shops, Tenjin Chikagai is an underground shopper’s paradise! The soft lighting and stone paved paths create the atmosphere of a unique underground village and mean you can completely ignore the weather. It’s the perfect location for serious shoppers: in the centre of Tenjin, connected to all nearby subway entrances and most neighbouring malls (like Daimaru, Tenjin Core, and Mitsukoshi). Most shops target women, although there are many cafes and free wi-fi to suit those who just want to relax. In the west side of Tenjin-Chikagai you’ll find this haven of “kawaii” (cuteness!). Almost anything “Hello Kitty” is possible here – phones cases, shirts, pen, keyrings, and much, much more! Here you’ll find a range of high-quality kimonos and the associated accessories, for adults and children alike. This cocktail dress shop is the place to go if you have a glamourous event coming up! You can also get matching accessories to go with your perfect dress. Salut is a small store which sells retro homeware and accessories. It’s a great place to find a unique gift or a quirky item to remind someone of a special time! This unique shop is a delight for those looking for cute but traditional items. There’s Japansese-style fans, bags, special cards, and even those two-finger tabi socks for those who fancy themselves as a ninja! “Kutsushita” means “socks” in Japanese, and “ya” indicates that the place is a shop – which is genuinely all that Kutsushitaya has to offer! 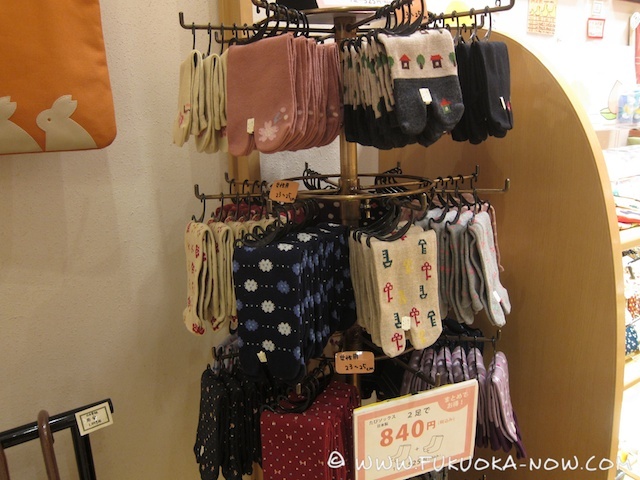 But the variety of socks is incredible – a range of colors, prints, styles, embroidered pairs, and stockings – so there’s bound to be something for you. Here you can buy not only Japanese green tea but also beautiful traditional tea sets. In store you can also try their “tea of the day”. Kaldi coffee stocks various kinds of specialist coffee but also a wide range of imported goods. It’s the place to go if you’re feeling homesick! You can stock up on French cheeses, European wines, foreign sweets, Indian curry spices and much more. This luxury Belgian chocolate shop has a store in every major city of the world. Selling not just traditional chocolate but ice cream, cakes and cookies – perfect as a treat to share with friends. Kabeya is a Soba restaurant. Soba noodles are made from buckwheat flour, and are very popular in Japan, so if you haven’t had the chance to try them yet, here’s a great place! What’s perfect about Tenjin Chikagai is that your time there will be completely unaffected by the weather. With a host of cafes, it’s easy to stop for a break, and if you feel like moving around it’s easy to connect to a neighbouring mall or department store. Tenjin Chikagai wasn’t really designed with children in mind, although the Hello Kitty shop may please some youngsters. There’s not so much for men – a few stores selling workwear, shirts and suits, but there are many cafes and the free wi-fi service available to help to kill time. Tenjin Chikagai is an essential visit for female shoppers – it’s bursting with shops of varying styles, from casual to classical and traditional. Plus there’s more than plenty shoe stores, lingerie shops, and cosmetic and accessories shops. Numerous shops in Tenjin-Chikagai sell Japanese tea, kimonos, small knick-knacks and inexpensive souvenirs for you to remember your trip to Fukuoka. Connections are available to almost all main department stores in Tenjin.